Since Mother's Day has just passed and Fathers Day is right around the corner, I have a couple of awesome books that your little one will enjoy, while spending time with you reading them. 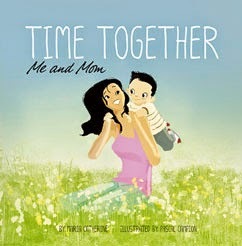 Appropriately titled, "Time Together : Me and Dad" and "Time Together: Me and Mom!" As any good Mom and Dad know, the little moments are what add up to big memories in a child's life. The little moments like reading a book, telling secrets, cuddling or even spending quiet time are the moments that count. These colorful books written by Maria Catherine and published by Capstone are perfect for a quick read with your little one. "Snapshots of a father and child enjoying every day moments together. From reading a book to playing outside, these small moments are the ones that create big memories." These beautifully written books highlight those moments that we often take for granted, and really put things into perspective. The books are just short enough that they hold a smaller child's attention, and they are heartwarming to parents! Page after page is filled with awesome moments that parents share with their little ones! 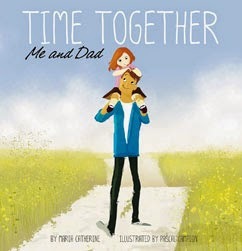 "Time Together: Me and Dad" would make the perfect fathers day gift from your little one to their adoring Daddy! The above item was received by Paige in order to facilitate. The Nurse Mommy blog will always provide honest opinions, beliefs or experiences on products reviewed. If you have any questions, please contact me at nursemommypaige at yahoo dot com. The disclosure is done in accordance with the Federal Trade Commission 10 CFR, Part 255 Guides Concerning the use of Endorsements and Testimonials in Advertising.